U.K. Chart Detail : Did NOT chart. Detail : Ringo's ninth solo single. Once again, two tracks lifted from his "Rotogravure" album. The A-side had been a hit for Bruce Channel in 1962 when it reached number 2 in the U.K. chart, but this time around failed for Ringo. The A-side featured Lon Van Eaton, Cooker Lo Presti, Jim Keltner, and John Jarvis. 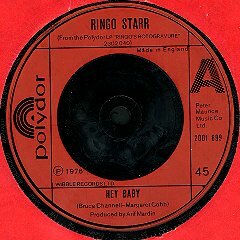 The single was not released in a picture sleeve, and had the standard Polydor label of the period.